Looking for broad exposure to small-cap stocks? Start here. Chances are you haven't heard of software company Manhattan Associates (NASDAQ:MANH), healthcare staffing provider Team Health Holdings (NYSE:TMH), or self-storage facility operator CubeSmart (NYSE:CUBE). These stocks likely haven't made it onto your watch list for a simple reason: They're absolutely tiny. CubeSmart's market capitalization is $170 million. Manhattan Associates and Team Health are both closer to $70 million companies. But each one is a top holding of the iShares Russell 2000 ETF (NYSEMKT:IWM). And through that fund, millions of investors own a piece of these small businesses. Because it delivers exposure to small-cap stocks while keeping expenses low, the iShares Russell 2000 is one of the most popular exchange-traded funds in the market. With that in mind, here's what you should know if you're thinking about adding this fund to your portfolio. This ETF is designed to track the performance of the Russell 2000 index, comprised of the 2,000 smallest stocks on the U.S. market. Put another way, the Russell 2000 ETF is what you would get if you ranked all public companies by market capitalization and just removed the 1,000 largest ones. What you're left with, the small-cap stock universe, is an important asset class that you wouldn't want to leave out of a broadly diversified portfolio. Because so much financial weight is concentrated at the top, the Russell 2000 index only represents 10% of the market capitalization of the entire market, with the remaining 90% taken up by the biggest one-third of stocks. The average stock in the index is worth $2 billion, while the median Russell 2000 stock is $800 million in size. The single largest current member is $6 billion biotech Anacor Pharmaceuticals (UNKNOWN:ANAC.DL). 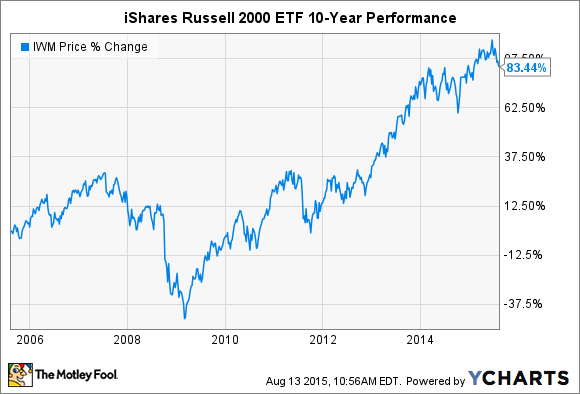 But if Anacor stays that big, iShares Russell 2000 ETF owners won't benefit from its growth for much longer. That's because the index is rebuilt from scratch each year to ensure that it only ever captures the results of the smallest stocks on the market. That way, companies that experience strong growth that launches them into large-cap status "do not distort the performance and characteristics of the true small-cap opportunity set," Russell explains. So, you should think of this ETF as a rolling snapshot of the tiniest stocks in the market. That approach also results in higher turnover than you typically see in larger index-based funds. The Russell 2000 ETF churns through 20% of its stocks every year, which corresponds to a completely new set of companies roughly every five years. The SPDR S&P 500 ETF, by contrast, has a turnover of less than 5% per year. That difference could explain the expense gap between these two index funds: the SPY costs investors 0.1%, compared to 0.2% for iShares' ETF. Finally, the iShares Russell 2000 ETF doesn't have the company-specific concentration risk that we see in the SPDR S&P 500 ETF, which just means it isn't dominated by any huge members -- Anacor represents just 0.32% of the Russell 2000 weighting as its single top holding. But the Russell 2000 ETF does have higher sector-specific concentration risk than the broader market. Financial stocks make up 24% of its holdings right now, compared to 17% of the S&P 500. And consumer staples are underrepresented at just 3% verses 10% of the stock market as a whole. Still, if you're looking to balance your portfolio against the technology-dominated large-cap giants, you should consider investing in this ever-changing basket of small-cap stocks.